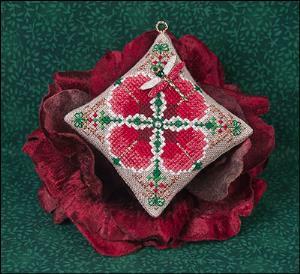 The gorgeous Christmas flower on this ornament is stitched with DMC in shades of red, white and green and accented with gold braid. Tiny backstitched dragonflies adorn the 4 corners. The center is tufted with a crystal pearl, and we provide a gold hanging ring. Just Nan is offering this elegant Christmas ornament in 2 versions. Both feature painted, glittered and jeweled dragonflies, all done by hand in a 6-step process. The design is the same for both. Threads used: DMC and Kreinik #4 Braid 202HL.